If you’re unaware of the term, Computer monitoring software is a type of application that can be installed on a computer to monitor and log everything that happens on that computer, for you to then look over at a later date. It is usually used by schools & parents wanting to keep an eye on kids, or employers who want to keep an eye on their employees. There are a variety of monitoring applications available online, but in this article we’re going to take a look at one in particular: Gecko Monitor. 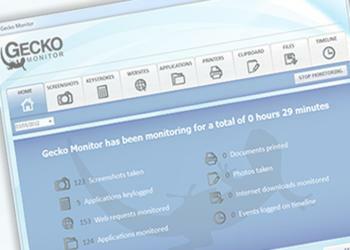 Gecko Monitor is a stealth computer monitoring application from Gecko (parental control software is also available from them) which is available to download online from their website. Once installed and set up, Gecko Monitor will run in stealth, meaning it will be completely hidden from anyone using the computer. Even computer whiz kids won’t know it’s running, as you’ll see no sign of it in places like the start menu, task manager, add/remove programs tool or the program files directory. In fact, the only way to open the software is by using a key combination and password that you choose when you set up the program. All of this will be marked with the date and time and a few more pieces of information. Screen shots are taken every 30 seconds (although this can be changed in the settings) and every time a new web page is opened, so that you can have a quick glance at the content of any web page you don’t know. Gecko Monitor also includes a remote reporting function via email. You can enter your details and have the reports send to your email address at intervals you choose. You can then look through the reports away from the monitored computer. All the features in the software are fully customizable in the settings, so you can have the software run exactly the way you want. You can even even have a password protected icon show in the task bar so that users know they are being monitored. Cell Phone Tracking Technology – Good or Harmful?